Laura Schwinn wants to connect with each individual student and equip them with skills they can use immediately in real world applications. The fact that students leave her classroom with a tangible product, such as a yearbook or a photography portfolio, helps them see the value of the content they are learning. “I would walk into her classroom every day knowing three things would happen: I would learn something new, be appropriately challenged, and I’d have a ton of fun,” said a former student. Schwinn earned a bachelor’s in education from Kansas State University in 2002 and an ESL endorsement from KSU in 2009. She began her career in 2002, teaching English/journalism at Marysville Jr/Sr High School. 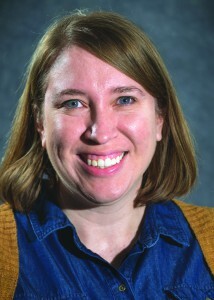 In 2003, she returned to her alma mater, Emporia High School, where currently she teaches A/V communications courses. Schwinn has grown and evolved along with the digital media she guides students to explore. Stepping in to sponsor the yearbook and student newspaper, Schwinn shifted her teaching emphases from basic strategies and classroom management to enabling students to find real world connections to their work. She developed what was once a traditional print newspaper into a web-based platform involving photography and video production that routinely wins awards. The yearbook wins awards as well, and while other schools have difficulty selling their yearbook, sales have increased under Schwinn’s guidance.